Back in 2005, when Rat Race was being run from the back of a characterful-yet-cantankerous old Ford Cortina, we chanced upon a splendid ruddy fellow going by the name of The Laird. He invited us to his fine Estates in the Scottish Borders with the promise of setting about creating a unique mountain run in the dark with lashings of natural obstacles and a few brisk river crossings. He described it as a 10k-ish. What he did not divine to tell us at the time was that his “rounding exercise” was completed after a whisky or two. Of course, back in the Noughties, when Men were Men and young Britney ruled the Charts, a GPS watch was something that NASA issued to its astronauts, not a timepiece for the common Man; so we trusted his judgement and went along with it. How wrong he was and how feckless we were! You may hear the echo of his jowly laughs as you scale the scree or wonder when the finish line will appear whilst you are well into your 14th kilometre. Join us with your head-torch and be part of the incredible stream of light that flows through these Scottish hills. Bring your own GPS watch and maybe, just maybe, you will unravel the riddle and uncover the true distance of ‘The Mighty,’ laying to rest the Legend of the Laird once and for all. Or you could just google it. Someone will have posted it on Strava. The Full Stalker and the Half Stalker start in waves every 10 minutes between 17:20 and 18:30. Wave 1 at 17:20 is reserved for Full Stalkers only. The Double Deerstalker waves starts an hour and twenty minutes before everyone else, at 15:00.  Day Stalker wave starts at 16:00. You should be prepared to get wet up to your waist, and probably your arms beyond your elbows. We don’t plan for you to go underwater…unless you fall over! Do I need a map and compass to complete the run? How hard are these events truthfully? The only kit you’re not likely to have is a headtorch. Make sure you buy a quality one and have at least 1 practise running with it at night. Other kit is down to personal choice to cope with the prevailing conditions i.e. waterproof jacket, thermal base layer, trail shoes, hat, gloves etc. The event village can get muddy underfoot so we would recommend bringing a pair of wellies to get changed into after the race. If camping bring bin bags as our campsites follow the country side code that you should take your litter home with you. A trolley might be handy to carry your stuff from the car park in a separate field as it is a small 5-10min walk. If you are leaving some warm clothes to pull on at the finish area then these need to be in a water proof bag as it is an outside bag drop. However, small valuables can be left in an envelope in our undercover valuables drop. Can we wear any kind of fancy dress? Is the water we cross through clean enough? Event entry includes a standard Rat Race tech tee, sizes are available on a first come first served basis at Registration. Where can I buy the event hoodie and t-shirt? You can purchase t-shirts and hoodies from the Rat Race Store online or on the day. No BBQs of any type, no open fires, and no large “Calor gas” style bottle cooking/heating appliances. Small personal gas stoves are permitted if used responsibly, but we encourage you instead, for the safety of everyone camping, to use the onsite catering facilities we have provided for you. There is a water station on the course, the Half Stalker passes it once and the Full Stalker passes it twice. Double Stalkers get an addition halfway pit stop with water, snacks and hot tea. No. We do not offer refunds but we do offer event transfer vouchers, so you can put your credit to another event. We need 10 calendar days’ notice prior to the event to make these changes plus you will need to pay a £15 or 15% (whichever is greater) cancellation fee. Our pricing structure rewards those that commit furthest in advance and we recommend customers hold the appropriate insurance to cover non-attendance for issues such as illness or travel problems. You can view our transfer policy here. Transfer requests can be made here. You can find full Terms and Conditions here. Rat Reward Members are able to transfer their entry 24 hours prior to the event for free. You need to be at least 16 years old on the day of the run. Everyone aged 16 or 17 must provide parental consent for their participation, which must be brought to the registration. When do you close the entries? We will close entries on the Sunday evening before the event or when the event is full. No. Where there is any risk due to water levels full safety cover is in place where required * Full immersion in water is always subject to weather and environmental factors in these events. The events are in March, which means it could be wet and it could be chilly. You should prepare for the weather conditions and run in what you feel most comfortable in for a tough run, in March at night, which features mud and water in healthy doses! Robust off road trainers should be used. You will be getting wet therefore wear shorts, socks and footwear that will dry/drain quickly afterwards, if possible. In all events, you will also be getting muddy. Check out the apparel in the Rat Race Store for some inspiration and kit picks for the event which makes a great base layer under a fancy dress costume. Can I skip and obstacle if its too much for me? The course is designed so that all obstacles are achievable, even if you have to rely on other runners to get help you through it. However no obstacle is obligatory and you should only complete what you feel comfortable doing, there will always be a bypass option. Yes, they are allowed at the event village only as long as they are on a lead, under the control of their owners & are cleaned up after. Dogs are NOT allowed to take part in the runs and are NOT permitted in the campsite. If you think you’re going to be on the course for a long time, get a place in an early wave to give yourself the best chance of completing. We’ll never leave a participant out on the course without the full cover of our safety staff, but due to the dark and remote nature of these events, we reserve the right to impose a course short-cut if deemed necessary. No materials are sent out before the event but those who have pre-purchased car parking tickets will receive them in the post. Parking for car-sized vehicles will be in a field that is a short walk along a small public road to the event village. Please be vigilant when walking on the road. The event car park operates as a one way system in order that cars are parked facing downhill and exit at the bottom of the field. Large vehicles, such as camper vans will not be admitted into the event car park due to the riverside exit not being suitable for large vehicles. The closest place for oversize vehicles to park is the Forestry Commission’s Innerleithen Trails Carpark which is between Innerleithen and Traquair House and will have Forestry Commission fees. While the car parking field is very good, March Scottish weather is always a concern so drivers should come in a suitable vehicle for parking off road and know where their towing eye is stored and how and where to fit it, so that your vehicle can be properly equipped should our team need to assist. The car park is managed until midnight on the Saturday night. Please car share where possible as this helps ease congestion, is easier on the parking field surface, saves you money and helps the environment. Advance tickets are £10. Available online until the end of February. Is there a pick-up and drop-off process? Yes. Please help us to keep traffic flowing on these narrow country roads by following the instructions contained in our pre event Essential Information document that is sent out in the weeks prior to the event. DROP OFF: For pre-run drop off, follow the event signs from Innerleithen until the signs split for Car Park and Drop Off at the monument cross roads. The Drop Off signs will lead you to the small layby at the main gates to Traquair House (not the small gates to the event field) where you will see a security guard and the event village in the background. Please drop off promptly here and exit in the direction of Cardrona where you can re-join the A72. This gateway will be busy with our production traffic, support vehicles and other folk dropping off so please do not attempt to turn around. PICK UP: After 18:30 on Saturday it is possible for cars to enter the event Car Park for no charge in order that you can park your car and go to meet up with runners. Please follow our signage and marshals advice. Are campervans and caravans welcome? Afraid not. The Mighty Deerstalker is unable to accommodate vehicles larger than a car. There are no facilities for campervans and caravans. Vehicles bigger than a standard car will need to park in the Forestry Commission’s Innerleithen Trails Carpark which is located between Innerleithen and Traquair House and will have Forestry Commission fees. At Deerstalker we offer two camping areas. 1. General Camping: This is a fenced area in the event village field. Each camper needs a camping ticket. Tents are pitched on a first-come first-served basis. Please leave fire lanes clear. We ask that your tents are not larger than 12×12 feet each (approx 3.5×3.5m). Space is limited so please keep this in mind when deciding what size tent to bring. NO COMMUNAL GAZEBOS PERMITTED. General camping will have its own dedicated toilets. Drinking water is available in the event village. Camping space is finite so we recommend you buy your camping pass as soon as possible. Book General Camping here. 2. The Old Walled Garden glamping and pre-pitched tents: The Old Walled Garden will be exclusive for those purchasing pre-pitched camping packages. This camping are benefits from shelter from the wind, its own dedicated Men’s and Women’s indoor flushing toilets, and access to the heated showers. Each pre-pitched tent package includes camping pass and parking ticket in the main event parking area. Some packages include heaters, in-tent plug sockets and bedding. See our packages here.  Showers have not been available at a Deerstalker for the past 10 years due to space and infrastructure restrictions. This year we will have showers included in all our Walled Garden tent packages – see these here. How do I collect my camping pass? General Camping passes are collected from the Camping Office that is located at the entrance to the General Camping area. Passes need to be collected in the bill payers name and we need to see ID before we can release the passes so we know they have gone to the right person. Once you have a camping pass you can head into the camping area. Those in the Walled Garden will be sent instructions before the event about how to access the Walled Garden. Campsite opening times will be communicated in the Event Information document in the weeks prior to the event. Yes. Respecting other campers is a core part of Deerstalker. There is no ‘quite zone’ for the campsite – it is all a quiet zone once the party ends. For those that are light sleepers we recommend that you bring earplugs within your essential kit. By entering this event you agreed that you have entered in your own name (not nickname) and will bring photographic ID to event Registration to prove your identity. If you cannot prove your identity at that time then you won’t be able to complete event registration and therefore won’t be able to run. You also agreed that in such cases, no refunds will be given or transfers to future events offered.